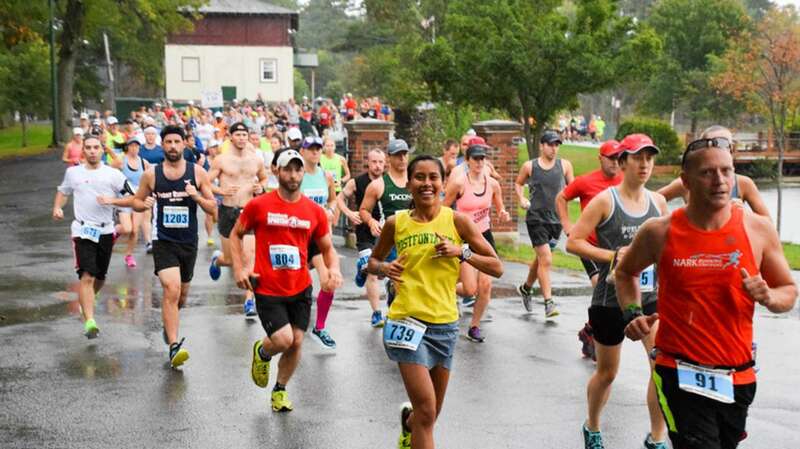 There's a saying around this part of New York: The path to Boston starts in Schenectady--that's because on average 30 percent of the Boston Marathon runners qualify at the Mohawk Hudson Marathon, that finishes up in Albany. This is a point-to-point course that is primarily flat and fast, with a net elevation loss of 370 feet. The half marathon uses the second half of the marathon course. The marathon is part of the Hudson Mohawk Road Runners Club Grand Prix Series. 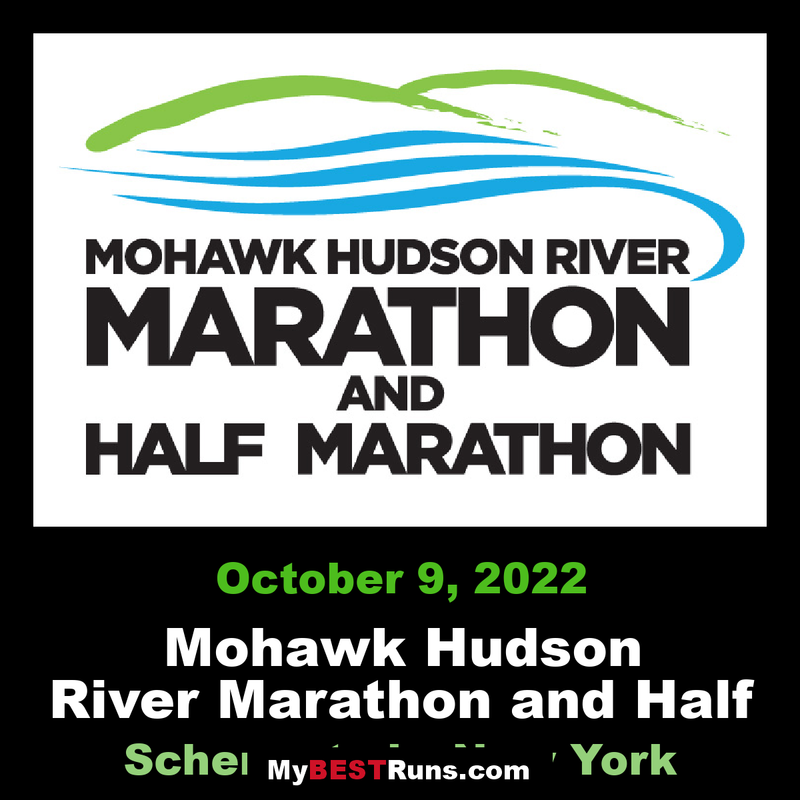 I vote for the Mohawk Hudson River Marathon that goes from Schenectady to Albany, New York. I qualified for Boston at the Mohawk as did about 30% of all runners. Race along the historic Mohawk and Hudson Rivers utilizing 18 miles of paved bikeways. The USATF certified course starts in Central Park in Schenectady and finishes on the bike path in downtown Albany. The course generally follows the Mohawk River, on paved bicycle trails, then proceeds to the Hudson River, via the historic city of Watervliet. The course passes immediately in front of the Watervliet Arsenal, the nation's only large bore cannon manufacturer. The historic munitions plant opened in 1813, and is still a major producer of munitions. Shortly after passing the Watervliet Arsenal it is back to the bike path for the final 5 miles along the historic Hudson River. This is a point-to-point course that is primarily flat and fast, with a net elevation loss of 370 feet. The Hannaford Supermarkets Half Marathon uses the second half of the marathon course. Approximately two-thirds of the marathon course is on paved bike path, one-third on city streets. The bike path is not closed to public use and city streets are not closed to vehicular traffic. Participants are required to run or walk on the left shoulder of the road when using city streets, unless otherwise instructed by race or police officials. Please use caution. Both courses cross a freight railroad line. Trains are not on a schedule and their frequency cannot be predicted, Timing mats are provided to capture any delay by the train. For your safety and the safety of all other runners, course officials and race volunteers, the use of headphones during the event is strongly discouraged. Both races are run on certified courses (Marathon:USATF Certificate NY13094JG,Hannaford Supermarkets Half Marathon: USATF Certificate NY13095JG). The marathon is a Boston-qualifier. The Marathon is part of the Hudson Mohawk Road Runners Club Grand Prix Series. The course will be open and supported for six hours (from 8:00 a.m. to 2:00 p.m.). Water and sports drink will be available approximately every two miles. GU will be available at two locations on the marathon course. Portable toilets will be at each water stop beginning at mile 4 of the marathon.